E353: JR East's E351 replacement? Google only told me it's available as PlaRail, and some one-year old note by Kato stated they were still in negotiations about the 353 with JR East at that time. I'm pretty sure the model will take a while. The currently running set is a Pre-production set. I expect Kato to wait for the final production variant to be delivered to replicate those. 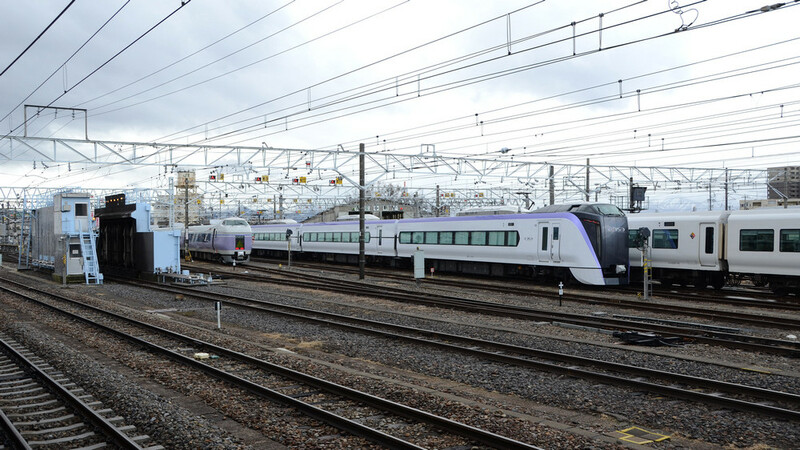 JR East just announced that the E353 will commence regular Super Azusa service from December 23rd. There will be eight trains per day. Looks like it won't be long until the E351 series will be completely replaced. It's a bit sad because it's one of the first Japanese trains I ever knew about, which was probably because it's rather famous in the Netherlands for its resemblance to the Koploper EMUs. On the other side, there's many Japanese railfans knowing about the Koplopers units because of its resemblance to the E351 series haha. The E353 series is a worthy successor though, as I could judge with my own eyes this February in Matsumoto. Don't worry Densha, you'll just have to visit Kansai and check out the Thunderbirds or Shirasagis. Meanwhile, I was really hoping to see this run last July, but was 6mths too early. On a side note, I'm not really a fan of the design of the JR West high-cab EMUs to be honest. Now I want the E353 model... will Kato be doing them hopefully? Is this on your to ride list? Sure is. I got quite the thing planned for the end of the year. I hope it'll work out as I want it to. Speaking of which, has J-TREC started assembling additional E353 trainsets yet? I haven't heard a word recently. Additional sets in what sense? Do you mean mass production sets? You only need the two sets to operate the schedule shown above. If none of them breaks down that is. I also wonder has JR East talked about running the E353 as far north as Minami-Otari on the Ōito Line? Or will that be still limited to the E257 Series EMU? Looks great. I really love its design. Planning to ride it myself in 7 days. Hey Suica, please document your ride on the E353. Very good looking train. The black section and angled red tail lights give it an evil look from the rear. I think I'm getting really fond of Ken Okuyama's modern designs, unlike those of Noriaki Okabe. I already think the E7 series is the most beautiful looking Shinkansen in recent years. Mr. Okuyama was on two episodes of Jay Leno's Garage where train sketches could also be seen in his design sketchbook. He seems like a nice guy. Considering there are only 2 prototype pairs and 3 production sets, with one production set having a bunch of replacement cars due to a collision, it means the 5 full sets contain 2+2.5 slightly differently constructed sub sets even width somewhat differing body dimensions. This sounds like a maintenance nightmare for a company that operates mostly standardized trains. The new e353 series has at least standardized cab cars apparently with gangways on all fronts and the new cheaper pneumatic tilt system. Of course this means the distinctive egghead shape of the non gangwayed e351 cars will be sadly missed. I would like to hope there's a good chance to have the iconic cab car as a museum piece at the very minimum. I'm sure one of the E351系 end cars will end up in a museum. But sadly, I think the rest as they are retired will be headed for scrapping, since it's too expensive to maintain a older tilting trainset with pendulum-style tilting system that was built in relatively small numbers (only 60 total). In comparison, JNR got 277 381系 rail cars, and I wouldn't be surprised the ones retired recently from Kuroshio service are being use as spare parts for keep the Yakumo trainsets in operation. It appears that both S2/S22 and S5/S25 is being scheduled for quick scrapping after the start of 2018.